The last thing you want to do is dump a great big pile of topsoil and stick rocks on the surface. This isn’t a rock garden, it’s a plum pudding. Besides looking a bit lame, it’s not going to offer the kind of environment where Rock Stars® can set their roots down in cool and moist crevices. See more in our Photo Gallery. The plum pudding approach also has problems with soil erosion because the rocks are stuck on top rather than forming the structure, so they won’t do a proper job of stabilizing. Regular topsoil is usually too heavy and poorly drained for many alpine plants, and it needs amending to create a more light and open soil structure. Let’s face it, when you’re using large rocks to build a garden, you want to do it right the first time. Moving big rocks around is sort of like moving a piano – it may require the help of professionals with the proper equipment, or at least willing friends and relatives with strong backs. Then that leaves you with the fun part of planting the plants! 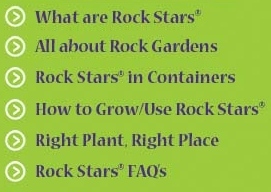 But you can still grow Rock Stars® without even touching a big rock. 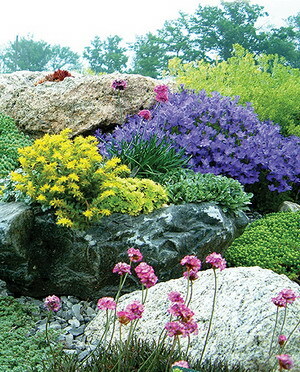 Before reading about how to actually grow these plants, we recommend taking a look at our page called All About Rock Gardens to get a sense of the basic styles of rock gardens that exist and what is involved in their construction. Just how simple or complicated to make your rock garden is entirely your choice. Just as important as the rocks is your choice of soil. Rock Stars® appreciate excellent drainage, so if your garden soil is heavy with clay, consider building your rock garden as a raised bed on top of the native soil, and using a soil blend such as the one below. Build your rock garden in layers, starting with one layer of rocks, filling in between them with the soil then continuing on to the next layer just like building a tall cake. As a rough guide, aim for about 2/3 rocks to 1/3 soil, from a visual standpoint. In other words, the space between the rocks will be largely crevices that you pack well with soil as you build.